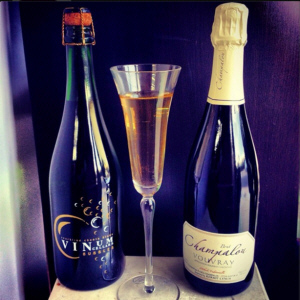 Sparkling wines are usually reserved for special occasions, but why wait? We crack it open when we’re looking for something that can easily transition between different food flavors and textures. And while yes, bubbles add a festive touch; they also act as a perfect palate cleanser between bites. The natural acidity of these wines helps brighten food flavors instead of overwhelming them. Light, fresh dishes call for a light wine, and sparkling wine fit the bill. Think of classic pairings such as oysters, caviar or cheese. But bubbly is also wonderful with salty, fatty or fried foods -the exact type of foods we usually find on the Thanksgiving table which is why we recommend it especially at Thanksgiving – because the brightness of the wine balances out the richness of the dish. The wine leaves you with a refreshed mouth and prepares your taste buds for another rich spoonful. Sparkling wines and Champagnes are food-pairing champions and provide both complimentary (like with like) and contrasting (opposites attract) notes. 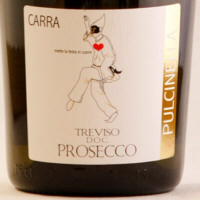 This is a flavorful, fun and festive Prosecco from Italy’s Treviso D.O.C in Veneto. It is characterized by its lively aromas and fruit and the ideal balance of acidity and sugar, which renders it both mellow and fresh. A lengthy sojourn on the lees endows it with concentration and intensity of flavors. Dry and persistent on the palate, it is a marvelous aperitif as well as an all around fish & fowl wine to accompany the entire meal or for pairing with fresh cheeses. Another sparkling wine made from Chenin Blanc, this one hails from France and is made by the Champalou family. It’s aged two years in the bottle before release, giving it a pale, straw color with floral and aromatic notes. A family-owned winery in the heart of Champagne, France, J. Lassalle is one of the only wines from the area that is allowed to complete malolactic fermentation. What results is a complex and diverse wine that totally delivers at this price point. Much more sophisticated than other mass marketed champagnes, this is true artisan champagne that will be appreciated and enjoyed with a variety of food. Founded in 1896, this winery produces grower champagnes that are characterized by super-fine bubbles, rich and deep aromatics and complex minerality that refreshes the mouth after each sip. Coming from a small, family-owned winery run by a mother-daughter team, this wine is given great attention to detail at every level. It is a true grower Champagne. This wine is light yellow-gold in color, has smoky notes filled with citrus and pears and a long, lasting finish. This is truly bottled magic. We have a large selection of Champagne Gift Baskets which can include any of these delicious champagnes.